What Operating System Has Crashed Here? This entry was posted in archeology, puzzle on April 15, 2011 by Michael Steil. Judging from the register set (D0-D7, A0-A7, SR) I’d say it’s an 68000 CPU. This also fits with the “level 7 interrupt” error. That looks a lot like a Commodore typeface. Is that Amiga? Gonna go out on a limb here and say it was the Apple Lisa. My first guess is some sort of Unix running on a Vic-20. Since that’s ridiculous, the next closest guess is the Amiga. I understand there was a version of Unix for Amiga at one time. That’s not an Amiga font – it’s almost identical to Commodore PET though. Good find Nicholas – that documentation even has the Level 7 message so it’s definitely the Lisa. It may be an OS running on an Amiga, but it’s not the AmigaOS. 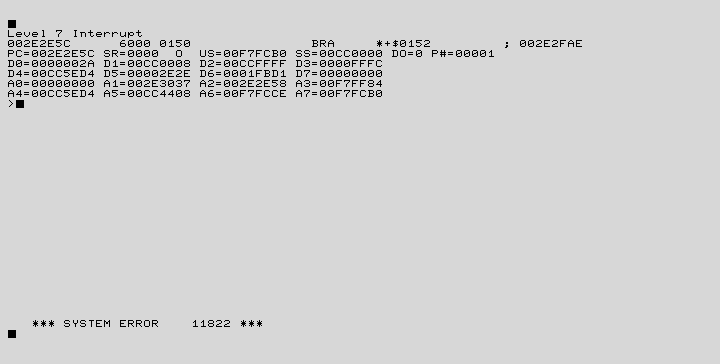 AmigaOS does not use this system font, nor does it trap the level 7 interrupt, nor does its internal debugger have a visual interface (it communicates entirely over the serial port). There are a LOT of ways to create an 8×8 bitmap font – I covered some of the system fonts http://damieng.com/blog/2011/03/27/typography-in-16-bits-system-fonts and http://damieng.com/blog/2011/02/20/typography-in-8-bits-system-fonts and it is actually as far as I can tell a direct rip of the PET font. Yes, it does appear to be the PET font, which is a weird choice. You can see some of the peculiarities in the 2, 5 and 7 are identical between the two. A minor quibble on your typography page: The TMS-9918 VDP doesn’t have a built in font or even a default font ROM, since it’s entirely “soft:” everything comes from RAM. And FWIW, the PPU in the NES is a different beast from the VDP. So the only question remaining is, what caused the crash? The TMS-9918 VDP datasheet at http://www.cs.columbia.edu/~sedwards/papers/TMS9918.pdf certainly documents a bitmap font toward the end. See page A-1 of the document: “Software programs apply to all three VDPs”. Then see page 4-6 and 4-9 to 4-15. VDP uses an external font generator. I agree with darkstar, my guess is A/UX on a 68k mac. It’s probably not a 68020, ‘030 or ‘040 – they have two supervisor stack pointers (although it is possible that the crash dump would only show one of them). It’s not a ‘008 either, because the PC has too many bits in it. Oddly, SR indicates that it’s in user mode, but that does not necessarily mean anything. Could this be a MiNT crash on an Atari machine? Just a thought. More importantly, has anyone tried turning it off and back on again? Looks like a 68000 system. Pre 68020 since all addresses are in the 24 bit range. The program counter is in the 0x2e memory block and the stack pointer (a7) is in the 0xf7 memory block. Both these places probably has ram. On the Amiga, 0x2e is in the Fast ram (expansion) area, so thats good, but 0xf7 is in the system rom. So its probably not Amiga hardware. On the Atari ST, 0x2e is in the expansion ram area, and 0xf7 is in an unmapped memory area. So probably not Atari ST, unless its a action replay like device. Could not find any memory layout docs for Lisa, Old Macintosh or 68K sun. Its probably Microsoft Xenix running on one of it’s supported 68000 platforms, probably Apple Lisa but it could be the Alto. The font is the same and everything. Here is instructions on how to run the emulator yourself. I am the only one that feels a little bit of discomfort in noticing that there are THREE cursors in the image? The BRA at the top means Bob Ran Away, hence the crash – Bob is the world, so without Bob there is no world, just grey with funny letters and numbers; level 7 refers to the Microsoft senior management grade – one of them came looking for Bob to make his mail-thing work again (he’s forgotten about having to click something to send the email again. Silly Microsoft senior manager). Where do I collect my prize from? Excellent work everyone! It is indeed the Apple Lisa (68K), and it’s the standard Lisa operating system. The prize goes to Nicholas Riley for analyzing the screen size and proving it with another screenshot, second class prizes to Darkstar for recognizing the 68K first, Johan for the very detailed analysis, and Clovis for the very creative answer!